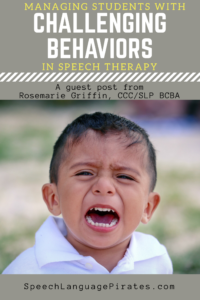 I am so happy to have Rosemarie Griffin, CCC/SLP BCBA guest blogging today. Rosemarie brings a new perspective to therapy, given her ABA background. I hope you can use her tips! Has this happened to you before? You go to a classroom or a waiting room to get a student for therapy. The student is playing happily on their iPad or with a really amazing toy. You walk up to them and say “ Hi, time for therapy.” The student automatically believes they must stop engaging with their favorite toy and begin to have a tantrum. Eeek – not a great way to start a therapy session. Read the strategies below to learn tips for building rapport with students who demonstrate maladaptive behavior. The next area to consider is, can this student request their wants and needs throughout the day? If the student is not able to spontaneously tell you what they want to play with or do for fun, this is an area that will need direct teaching. The ability to request was described as “manding” by B.F. Skinner (1957). He wrote a book called, Verbal Behavior that discussed why we communicate and how our communication develops and grows. Direct teaching regarding requesting is referred to as mand training. Working on helping a student request their favorite things, will help them increase their overall spontaneous communication and decrease the level of maladaptive behavior that they may be engaging in. The last area I want to address today is for student’s who may be able to verbalize but who are still limited verbally. Let’s say that a student has earned a break with the ipad and after their break is done, they have a hard time putting the ipad away. Instead of saying “ Can I have one more minute, “ they latch onto the ipad and will not put it down. In this case, it would be great to use functional communication training. We would help them learn a phrase or word (depending on their language level) to get their needs met in moments when they are displaying maladaptive behavior. If you are working with a student who engages in high rates or intense problem behavior, remember that collaborating with a board certified behavior analyst (BCBA) could help get a game plan together to decrease this behavior. Working with students with challenging behavior can be overwhelming and rewarding all at once. Remember to take time to build rapport with your student and help them increase their ability to request preferred items and activities. Direct instruction in these areas, will help you and your student have more fulfilling therapy sessions! Rosemarie Griffin is a speech language pathologist, board certified behavior analyst and product developer. She is the creator of the Action Builder Cards. To learn more about working with students with challenging behavior or to gather information about using applied behavior analysis to help students increase their communication skills, check out her website www.abaspeech.org or like her facebook page here: ABA SPEECH ON FACEBOOK.